Home → Vaporizers → Desktop Vaporizers → Arizer Extreme Q Review: How Does it Stack Up Against the Competition? Arizer Extreme Q Review: How Does it Stack Up Against the Competition? On this website, we do a whole lot of reviews for portable vaporizers. Portable vapes are easily some of the most popular vaporizers that currently exist, as they fit perfectly into our lives that seem to be getting busier and busier with each day that passes. You can use portable/handheld vapes while at home or on the go, but what if you’re looking to pick up a desktop vaporizer? There are lots of desktop vapes to choose from, but if you want one of the absolute best ones that money can buy, you’ll want to keep reading my Aroma Arizer Extreme Q review. The Extreme Q might not be as great with vaping bags as the Volcano is (another popular option), but if you want a supremely great desktop vape that won’t break the bank, you’d be hard-pressed to find something better than the Arizer option that I’ll be talking about here. Just why is that though? You’ll have to read on through my Arizer Extreme Q 4.0 review to find out. Arizer is one of the most well-known and loved brands in the vaping world, and the Extreme Q is a prime example as to just why this is. The Extreme Q 4.0 really is the pinnacle of budget-friendly desktop vaporizers, as it’s incredibly easy to use, features a fantastic design with a sturdy build quality, produces excellent vapor, and costs quite a bit less than other desktop vapes that offer a similar experience. Upon initially starting my Arizer Extreme Q vaporizer review, something that caught my attention right away was just how good this thing actually looks. Desktop vaporizers often take a backseat when it comes to good looks, but the Extreme Q is a great exception to this rule. Arizer decided to go with a flat plate-like design for the base of the Extreme Q, and the slightly tapered cylindrical look allows the vaporizer to give off the sense that it’s a product from the future. A quick glance at the Extreme Q might have you mistake it for a futurist coffee-maker, and that’s not necessarily a bad thing at all. Arizer decide to use quite a bit of glass throughout the overall design of the Extreme Q, and while some people might not be a fan of this, I personally think that it gives the Extreme Q a very premium and high-end look and feel. Another thing that peeked my interest quite a bit while working on my review was just how quiet this thing is while using it. The larger nature of desktop vaporizers usually means that they often sound like jet engines while in use, but this isn’t the case at all with the Extreme Q.
Arizer was somehow able to make this vape extremely quiet while turned on and functioning, and along with making it more inconspicuous, it also means that you won’t annoy others in the room who are maybe trying to relax while you’re taking a load off. We expect expensive desktop vapes to come with a heap of accessories, but this isn’t something that you usually get with budget options. However, this is another area where Arizer surprises us for the better. When you purchase the Extreme Q, you’ll get a pile of included accessories along with the vape itself, including bags, whips, extra mouthpieces, additional screens, remote control (more on that in a little bit), a tool for stirring your dry herbs, and more. This is an awesome value-add, and it makes the Extreme Q even more worthy of its already affordable price. Desktop vapes are favored by a lot of people because they usually come with more features and controls to mess around with than portable vapes do, and this is certainly true for the Extreme Q. There are tons of temperature settings to tweak and mess around with, and the insane accuracy of the temperature control settings is a fantastic addition. Going back to that glass construction, there is a bit of a downside that comes with it - it’s incredibly easy to accidentally break. Assembling desktop vapes is never that easy of a task, and if you accidentally drop one of the pieces for the Extreme Q while putting it together, there’s a very good chance that it’ll break entirely. This certainly is a pain point, but when you consider that this allows for very clear vapor, it’s a pretty fair tradeoff if you ask me. Something that I found to be insanely useful while using the Arizer Extreme Q is the remote control that comes bundled with the vaporizer. The remote controls allows you to turn on and start the Extreme Q while across the room, and while this might sound like a very small addition at first, it actually proved to be incredibly convenient and powerful. 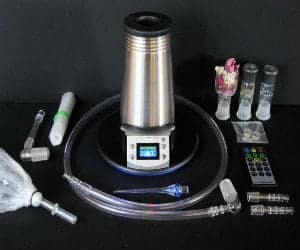 Being able to turn on and start the Extreme Q without having to be right by it means that you can turn it on while you’re watching TV, working on the computer, or anything else and let the device build up a good amount of vapor before you start taking draws from it. This is something that I definitely wouldn’t have expected from a desktop vape that costs as little as the Extreme Q does, but it’s a feature that I’d definitely like to see included in more vapes going forward. To wrap up my review, this is one of the best affordable desktop vaporizers that money can currently buy. The Extreme Q features an elegant and modern design, creates excellent vapor, comes with a ton of additional accessories and controls, and it won’t cost you an arm and a leg. This truly is a phenomenal product, and even if you aren’t on a budget, it’s still easily worth checking out.